If you’ve ever been curious about what life looks like for a work-from-home mom of an 8 month old baby, this post is for you! This is my first time writing a post like this (it was suggested when I surveyed readers via Instagram about topics they’d like to read about in the new year) and I’m already looking forward to reading it in a few years. With small business and motherhood, everything changes SO FAST! I want to preface this by saying I decided I was writing this post on a whim around lunchtime last Thursday and started scrawling notes onto the backside of a nearby envelope. We recently switched to a new sleep/nap schedule for Sage and it’s been great for us. I’m really enjoying a more predictable schedule, and even though baby girl is not even close to sleeping through the night right now (thanks 8 month sleep regression! ), things feel much more manageable for the time being since we have this new daily routine in place. Also, that picture above is from when Sage was 3 months old and we got family photos taken, so NOT a typical day in the life but I didn’t take many pictures on this day so I threw that one in for good measure. Ok, here we go! 6:30am | I wake up and hop in the shower, then put on my bathrobe so I can see Anthony off to work and start making breakfast for me and Sage. I usually make quiches for weekday breakfast that way Anthony can just grab a slice on his way out the door, but we’ve been running low on groceries so I didn’t have one made. 7:00am | I wake S up for the day, change her diaper and bring her downstairs to the kitchen where I put her in the high chair and we eat breakfast together. For me, scrambled eggs and a slice of beer bread I made earlier in the week and for her, scrambled eggs and some leftover oatmeal I made her for breakfast the day before. 7:30am-8:30am | I take my coffee into the living room and we play for about an hour. At this stage, she’s really enjoying knocking down the block towers I build and reading books. At 8:30, she starts looking a little tired - not rubbing her eyes yet, but she gets the vacant stare and starts sucking her thumb. I recently realized that’s the time to start getting her ready for a nap. 8:30am | I carry S upstairs, nurse her and sing her a little song then lay her in the crib awake. She plays in the crib quietly on her own for about 15 minutes then falls asleep close to 9:00. I check on her periodically on the monitor and have noticed this has become her morning pattern. Girl likes her alone time, I get it! After I put S down, I get dressed and go downstairs to start my work day. 10:30am | S wakes up, I change her diaper and get her dressed for the day. While we have momentum, I just pack both of us up and get ready to leave the house. Our local library has a free Baby Literacy class on Thursdays I’ve been wanting to take her to and I decide today is the day! 11:00am | We arrive at the library to find out the Baby class was cancelled due to snow. Oh well! We return our books and get new ones, hanging out in the storytime area to give them a test read before we decided to take them home. We found one that’s definitely a new favorite and I added it to my Amazon wishlist before we left. While we’re there, I get a response for one of the potential client leads I followed up with earlier in the morning and send a few quick messages back and forth to answer her questions. 12:00pm | We get home and I let S play in the walker while I make myself some lunch. Today it’s leftover pork BBQ and some baby carrots. I finish eating and S is still happily playing so I start listening to a podcast and take a few minutes to change a load of laundry I started yesterday and then my little sister Frankie calls, so S and I spend the next 20 minutes or so catching up with her via Facetime. 12:30pm | S is already acting tired again so I change her and take her upstairs for a nap, repeating the same routine from her first nap of the day. I make a mental note that I need to wash the cloth diapers because she’s in the last clean one. Then I send a voice message to my mother-in-law who’s coming this afternoon to watch her. At the moment, she comes from about 2:00pm until 5/6:00pm when Anthony gets home on Tuesdays and Thursdays. 12:50pm | I come back down to my studio for my second chunk of work time in the day and start by scheduling with the client I had been in touch with earlier. I then get a little distracted and watch this video my best friend posted to Facebook about the Codorus Beautification Initiative - York locals, wouldn’t this be amazing?! I check on S with the monitor and see she’s asleep. Then I start researching and pulling inspiration for a new project and answer a few inquiries from my February availability post through Instagram DM. 2:00pm | S wakes up, I nurse her and change her into a disposable because the cloth diapers still haven’t been washed. 2:10pm | My mother-in-law arrives and takes Chloe on a short walk then takes S for the afternoon. I spend a little time cleaning up the house and put the cloth diapers in the washing machine. 2:40pm | I sit down to work again and spend a little more time working on that new project before shifting my focus to preparing interview questions for a potential part-time Studio Assistant who is coming at 4:00. 4:00pm | We have the interview and it goes great! She’s starting next week (this week by the time you’re reading this!) and I’m excited to introduce you guys to her. 4:45pm | After the interview, I come into the living room and chat with my mother-in-law and brother-in-law who also stopped by to see S. At this point, I’m pretty exhausted so I go to make myself some tea but got confused and made myself chamomile tea, which definitely wasn’t going to help things… Sage starts getting a little fussy so I take her upstairs and nurse her and then lay her down. She doesn’t usually take a third nap, but she will lay in her crib for about 10-15 minutes, then she lets us know she’s ready to come back downstairs and she’s like a new baby again! It’s kind of odd but I love it. I’m pretty sure S is an introvert like me and just needs some alone time every once in a while to recharge her batteries. Between when I lay her down and go back to get her, I order Instacart like I’ve been meaning to do all day because, again, we are running low on groceries. 5:30pm | Anthony gets home a little late because he stopped at the grocery store, and we all chat in the kitchen for a bit before his mom and brother leave. We eat dinner, leftover chicken, rice and veggies for me and S and cereal for Anthony. We had “real” food for him, but he’s weird and wanted to try this new cereal he got at the store instead. We spend the next 30-45 minutes talking and playing with S. Just time together as a family! 6:30pm | We take S upstairs and give her a bath. Actually, Anthony does by himself. I start running the water and realize how completely tired I am and A takes over so I can lay down for 10 minutes. When I hear them finish with bathtime, I join them in the nursery. We get S in pajamas, I nurse her and we sing her a bedtime song with A on guitar. For a long time, we did “Country Roads” but we recently switched to “Jumper” by Third Eye Blind mostly because Daddy was getting a little tired of playing “Country Roads” every night. S is asleep by 7:00. 7:10pm | I come downstairs, dry the cloth diapers and clean up S’s high chair so it’s ready for breakfast the next day. Then I camp out in the kitchen while A takes a shower just in case our Instacart order is delivered while he’s in there. And good thing! Because it comes at about 7:30. I put the groceries away. 7:45pm | I go to bed. This isn’t normal, but I would also say it’s not NOT normal either… I didn’t actually fall asleep until much later but I was just completely drained and needed to lay down in a quiet room by myself! A took the opportunity to play some Fortnite with his other brother who’s in college a couple hours away at Penn State. He hasn’t had much time to do that since S was a tiny newborn. If I wasn’t so tired, Anthony and I probably would have done a few things around the house and then watched an episode of Jeopardy together. That’s another thing we haven’t done much since I was pregnant, but we’ve been able to catch the show a few times this week thanks to S’s new sleep schedule. He comes upstairs around 10:00 and I’m still semi-awake. Sage wakes up for the first time shortly after that and then the rest of the night is a blur. Okay, thoughts: Today was kind of a unicorn day that was packed to the brim but also felt very balanced between work and family. That doesn’t happen most days, or at least it hasn’t in the past. Looking back, I got a lot done but I was also totally burnt out by about 6:30pm. But overall I feel happy with the day as a whole, I just wish I had a little more time with Anthony but hey, we’ll catch up on the weekend. I want to note that the next day, I was planning to sleep in a little bit and let Sage wake me up. Well, Sage woke me up but it was at 6:00am instead of 7:00 so I guess half of my plan worked! So that day, I took it a little easier. We didn’t go anywhere and tried to rest more when Sage was napping. Do you guys have any questions for me? Are you confused why Anthony went to the grocery store and I ordered Instacart at practically the same time? If so, the answer is we get most things from Aldi and just a few things from our local Giant like frozen pie crusts for quiches and Diet Dr. Pepper, which Anthony drinks instead of coffee in the morning. I know. I told you he was weird! It feels a little strange writing out everything I did in a day but I know I love to read these types of posts too so I get why you guys were interested. I think it will be fun to remember this stage and what life was like with balancing motherhood and owning a small business. To share or not share? That’s the question. I’m a blogger with a child, but I think almost every parent can relate in a world that is increasingly operating online. Thinking about how to be intentional with the way I choose to share and what my boundaries are is something I’ve dedicated a lot of time and mental energy towards, starting even before our daughter was born. You might be wondering why I haven’t posted monthly updates about Sage (or you might not have noticed or cared - cheers!) and the answer is complicated. I’m still figuring out how I feel about parenting and blogging and social media. But I’m taking some time to get my thoughts out because I think this is an important conversation. What happens online matters and it is real life. I want to make it clear that I’m not judging any other parent for how they choose to handle this issue! It’s hard because I don’t think there is a clear right or wrong, but I wanted to make that clear before I move on with my own thoughts and how I’m handling it for the time being. In general, I am open to sharing my experience as a mother and the transition to parenthood here on the blog but I am less comfortable with sharing Sage’s life in such a permanent and public way. Partly because I feel that even though she’s only seven months old, it’s still her life and not mine to share. But even more than that, I don’t want to feed into comparison. As a parent, I think that every single thing Sage does it amazing and worth celebrating. Even though her physical development has little to do with me, it’s very rewarding from a personal sense. But I worry that sharing monthly posts about Sage would make me too aware of what she is or isn’t doing and how it stacks up to other babies her age. Babies develop at their own pace and the range of normal is so wide. But somehow it all evens out by the time they are toddlers. So I wonder if it’s really worth worrying if your baby is ahead or behind on milestones anyway? Outside of conversations with your pediatrician, family and close friends at least. I’m documenting these types of things in her baby book and that feels right to me. As far as social media goes, I have a private Instagram account that I created for Sage and intend to use to make one big photobook after her first birthday. On my personal/business Instagram account, I share some day-to-day stuff with Sage through Instagram Stories and will share about her periodically on my feed but almost never in real time. In general, I choose not to post about Sage on Facebook. I’m using my personal Facebook less these days - outside of Messenger, which I use a ton! Anthony and I each joined Facebook in 2006 so that means there’s already 13 years of our ramblings and photos floating around the internet forever. I’m not a stickler about it. I’ve broken my own rule a few times and I don’t mind if someone else shares a picture that Sage is in. There’s a big gray area between the sharing and not sharing, you guys. But I’ve found it easiest to make general rules for myself so that way I don’t have to make the decision everyday about where my boundaries are with sharing online. As a parent, there are more than enough decisions you have to make everyday already! Overall, my thinking is if I start sharing real-time updates of Sage now, by the time she’s old enough to Google her name she will have 100+ pages of search results. And that feels a little scary and overwhelming to me. It may not to you, and that’s fine! I guess having a child has shown me even more that I am kind of a private person, despite sharing some of my deepest, most vulnerable thoughts and experiences with you here in this little corner of the internet I’ve made for myself. How I feel about sharing Sage may change and evolve as she gets older - in fact, I’m certain it will! But in this first year of her life especially, I feel very protective over her and her babyhood. How do you choose to share or not share your children online? Reminder, I don’t think there’s a wrong answer! The best solution is the one that feels right for you and your family. But that being said, I would be interested to hear your thoughts and how you choose to handle this issue! Comment below or join the conversation on Instagram. Putting together a baby registry is hard work! There are way too many options and gadgets out there and it's hard to know what your baby will like and what you will actually use. I know so many friends and readers that are about to have babies, so I wanted to share my favorite products that I'm using with Sage everyday. This isn't a comprehensive list of what to put on your registry, more just a round up of my most-used items at this stage. Since I've been at this motherhood thing for all of 3 months, consider this "part one". If you guys are interested, I can share updates around 6 months and 1 year because heaven knows, what a baby needs and wants changes so much in the first year! 1. Wrap Style Carrier - Anthony and I both LOVE this thing! We also have an Ergo baby and a Moby wrap (both I found secondhand for a steal!) but this is CuddleBug Wrap Carrier is the one we reach for the most. The fabric is strong but stretchy which makes it a lot easier to get Sage in and out of. There are some good tutorials on YouTube if you are mystified on how these things work like I was. After watching a video and practicing tying it twice, I was a pro! 2. Pacifiers and Pacifier Clips - We introduced pacifiers around 3-4 weeks and Sage took the Natursutten the best. I like that it's made from natural rubber and has a large shield that touches her nose and chin to mimic the feeling of breastfeeding. I recently ordered a patPAT because it has a similar one piece design and love the idea of a pacifier and teether in one. Plus, Lindsey (the owner/inventor of Ryan & Rose) just rocks at Instagram stories. We were gifted a pacifier clip at our baby shower and I think these are the best invention ever. The pacifier clip also prevents her pacifier from falling on the floor and getting dirty and or lost. Sage mostly uses a pacifier for naps and at bedtime but it's so handy to just clip it to her outfit so I don't have to go looking for it when we need it! 3. Portable Changing Station - My cousin's wife has a SkipHop Portable Changing Station for her son, and I knew I wanted to add one to our registry! In addition to being a changing pad, it has pockets for diapers and wipes and folds up nicely so it's easy to carry or throw into the diaper bag. 4. Baby Swing - We have the Graco Simple Sway Baby Swing and Sage loves it! She takes her morning nap in it everyday. The seat can be taken off for it to be a standalone bouncy chair as well. It takes up a good bit of room, but it's definitely something we'll save for future babies once she outgrows it! 5. Sleep Sacks - The hospital was out of sleep sacks somehow during our stay so we used a swaddle blanket, but since we've been home we've put Sage in a sleep sack every night before bed. They are safer for babies than a loose blanket and there are options with a swaddle wrap and without. We used a newborn size swaddle style one for the first few weeks and now we have a few different 0-6 month sleep sacks we cycle through. I love the Blue Daisy pattern of this one! 6. Promptly Journal - This was a gift from my best friend and I LOVE IT! I was having trouble finding a baby book I liked and she surprised me with this one. She knows me so well! It's called A Complete Childhood History and it's a beautiful linen bound book with simple journal prompts from pregnancy to 18 years. It's really the perfect baby book! It comes in a bunch of pretty colors, ours is sage green, of course! 7. Muslin Hooded Bath Towel - These towels are so soft, dry quickly and look adorable on her! They are lightweight but very absorbent and they have little belts we can use to tie them like a robe once she gets a little bigger. 8. Canvas Diaper Backpack - my other best friend who lives in Hawaii now (and just had a baby herself!) sent us our dream diaper backpack stuffed with all the baby goodies. I can't say how much I love this bag! I wanted something utilitarian and unisex, so Anthony wouldn't feel silly carrying it but also, because I'm not a super girly girl anyway. I love having a backpack versus a purse style diaper bag because it keeps my hands and arms free. It has just the right number of pockets and side compartments that are great for stashing a water bottle and your phone. I give this diaper backpack a 10/10! It's from Oliday on Etsy. They have really nice looking camera bags and laptop bags too! 9. Dr. Bronners Unscented Baby Castile Soap - This is the soap we've been using with Sage since she was born. I love that castile soap has a million other uses and you just need a few drops so it lasts a long time. It's a natural, vegetable-based soap with no added fragrance or synthethic detergents or preservatives. 10. Baby Bath Support - I didn't want an enormous baby bathtub that was bulky and hard to store, because they grow out of them so quickly! This Angelcare Bath Support is perfect. It has a simple and streamlined design, a soft mesh material that comfy for Sage, drains easily and has a built in hook for easy storage. For our car seat and stroller, we have this Graco travel system. My sister-in-law suggested getting a jogging stroller instead of a regular one, and I'm glad I did! This thing can go over curbs, grass, gravel and rough terrain with ease. We'll probably get an additional lightweight umbrella stroller once Sage is a little older, but for now this is all we need! We are cloth diapering and honestly, it's not as hard as I thought it would be! This is the podcast that convinced me to give it a try. We use Bumgenius 5.0 Pocket Style cloth diapers and I'm really happy with them. One item I didn't register for but wish I did? A manual breast pump. I have a Medela double electric pump that was supplied by my insurance but I recently bought a one-piece silicone breast pump. (Shout out to my instagram friend Sierra for telling me about these!) Now that Sage is sleeping longer stretches, I found I was leaking a ton from whatever side I wasn't nursing her on in the middle of the night. Now I attach this thing and collect a couple ounces every night, just from the suction and completely hands-free. It would have been great to have for relieving engorgement in the early days of breastfeeding. The one piece design makes it super easy to clean too! I highly recommend it for any breastfeeding mom or mama-to-be. Ok, one more thing but this is the last one - I promise! I didn't originally include a baby monitor on my favorite things list because we just started using one more recently. But I really love the one we have now! It's the YI Home Camera. It works with an app on your phone, has the ability to add more cameras (if you have or plan to have multiple kiddos! ), has sound and video and also works as an intercom. And the best thing? It's only $30. Was this round up helpful? Would you like to see more motherhood and baby related posts on Stevie Storck Design Co. or are you just here for the interiors? Let me know in the comments below or join the conversation on Instagram! Disclosure: This post includes some affiliate links, meaning if you shop using the links in this post, I may earn a small commission at no additional cost to you. Thank you for supporting brands that support this blog! The day Anthony went back to work after Sage was born, I wanted to do everything I could to pump myself up for my first day of solo parenting. I took a shower, put on a pair of real (maternity) pants, and downloaded a new inspirational desktop background for my laptop. Actually, I couldn't decide on just one background so what I did was create a slideshow of positive quotes to use as a screensaver. I figured there would be plenty of times in my new mom life where I would be doing on something on my laptop and have to stop to nurse, change a diaper, or soothe a crying baby so my screensaver would be getting plenty of action. Now that I'm 2 months in, I can say that I was right! I'm so glad I thought to do that on my first day at home alone with Sage. Seeing these pretty wallpapers flash across my screen add a little extra brightness to my day, so I decided to team up with artist/illustrator/designer, Jamie Bee to create some beautiful, inspirational wallpapers to share with all of you! Whether you are facing a new challenge/adventure in your life like motherhood, or you just need a little inspiration for your day-to-day, I hope these wallpapers inspire you to keep a positive mindset! Use them individually as desktop wallpapers or all together as a screensaver slideshow like I do. Subscribe to SSDC & receive 7 FREE Desktop Wallpapers! 1. Click the button above and sign up for my blog newsletter. 2. An email with all seven wallpaper designs will be sent to your inbox! 3. Use them individually as desktop wallpapers, or as a slideshow for an inspiring laptop screensaver! 4. If you love these wallpapers, share this post with a friend! Jamie Bee is a college friend of mine and a local artist, illustrator and designer here in York, PA. And she's currently accepting new freelance work and collaborations! If you're in need of great web graphics for your blog or small business, a killer book cover design or illustration for your latest article, hit her up! You can see her portfolio and get in touch with Jamie through her website. Or, if you love corgis and cool, funny, irreverant art, you should probably follow her on Instagram too. She just started a 100 Day Challenge she's calling #100daysofinfluence. This is a post I've been really excited to write, for my own memories, for any expecting mamas out there and for anyone who just loves to read a good birth story! As I've written about before, during my pregnancy I did my best to prepare for a natural childbirth. It's not that I was majorly against the idea of an epidural, or if necessary a c-section. My end goal was always whatever it took to have a healthy and safe delivery. But after reading birth stories like Lindsay's, I found myself drawn to the idea of a natural, pain medication free birth. While I could envision having a home birth in the future, Anthony wasn't as comfortable with the idea. So I ordered the book, Natural Hospital Birth: The Best of Both Worlds for myself and the companion book The Birth Partner for Anthony. We also attended the Childbirth classes offered by our local hospital together, but tried not to do too much more research or preparation other than that. Every birth is so different, and at the end of the day, I believed that when the time came my body would know what to do. If you read my previous pregnancy posts, you'll know I had a lot of prelabor symptoms all throughout my third trimester. I was so convinced she would come early, that as I got closer to my due date I started getting more and more anxious. I tried a lot of the old wives tales, like walking a ton, eating pineapple, getting foot massages, walking down the stairs backwards, etc. The funny thing is waking up on my due date, I felt a sense of relief. Almost like, "Ok, I was wrong. She's officially not coming early"! I was still uncomfortable and hoping labor would start soon, but I was so much more chill in those days after my due date. When I was 3 days past due, I read an article that said it's a misconception that birth is a mechanical process and things like walking will induce labor. Birth is driven by hormones, specifically oxytocin which is why they use the synthethic version (pitocin) for medical inductions. A light bulb went off in my head-- I can make some oxytocin! I decided right then that I was going to be SUPER happy, even if I was uncomfortable and grumpy I would smile until I felt happy. That was around 5 or 6pm. I felt bad at that point that Anthony was basically housebound with a very pregnant and irritable wife, so I asked him what we could do that would make him really happy and he said he wanted to get Chinese for dinner! So we went to our local grocery store, which has delicious Chinese food. I smiled the whole time and laughed wholeheartedly at all of Anthony's silly Dad jokes that had been annoying me for weeks. On the way home, I was having contractions and I felt a weird feeling that was similar to a gas bubble rumbling in my stomach. I mentioned it to Anthony because it seemed to make the contraction hurt worse, but really I didn't think anything of it because I had been having contractions for months. Then once we got home, I was walking across our kitchen and my water started leaking out! That was 7:26pm. I was in denial at first --I said to Anthony, "Maybe I just peed myself?" -- but it became apparent pretty immediately that my water had definitely broken and I was in labor. We called the hospital but decided to eat dinner before we left because I knew I wouldn't be able to eat once we got there. At that point we didn't think we were in any rush, and I didn't want to go to the hospital too soon. I hadn't been timing the contractions before then, but as we were finishing dinner I pulled out the app on my phone and it turns out they were already 4 minutes apart. So we pretty quickly packed up dinner, grabbed our bags and headed out the door! This song came on while we were driving to hospital and it made me smile. We got to the hospital around 8:30pm, and although the contractions were already getting more intense I was adamant that I wanted to park in the garage with Anthony and walk in. I almost stopped and got a wheelchair at the hospital entrance because I was in the middle of a contraction, but it was over before I found one so I told Anthony we should just keep going! I remember asking him to put the exercise/birthing ball down so I could bounce on it through a contraction in the elevator and then again as we were doing the intake paperwork. Then we were escorted to the exam room, where they checked my cervix (2 cm and 80% effaced) and confirmed my water had broken before admitting me and taking us to our Labor & Delivery room. At that point, the contractions were getting pretty intense and an ultrasound confirmed that Sage was head down but face up. That meant the back of her head was pressing against my spine and causing some pretty painful back labor for me. It was so uncomfortable that I couldn't bear to lay on my back, so I moved around a lot. I started off sitting and rocking on the birth ball, then leaning over the birth ball on the bed, then sitting on the very end of the bed with pillows stacked on the tray so I could rest in between contractions. Around midnight, I was in so much pain that I asked if someone could please "just tell me about the IV pain meds one more time". Anthony was like "Are you sure?" and I said "I'm not saying I want them, I just want to hear about them". They asked if I wanted them to check me first and I said yes. At that point, I hadn't been checked since we'd been admitted. I had to lay on my back for the exam, and as soon I did, a contraction started and as soon as it was over that pain was replaced with the most terrible back pain. I definitely lost my cool at that point. If I was only at 3 or 4 cm, I think there was a good chance I would have asked for an epidural. We had decided if I did change my mind during labor, I would do an epidural instead of IV pain meds but being exhausted and in pain I wasn't exactly thinking straight. Luckily, the doctor told me I was at 6 to 7cm. I remember thinking 7cm isn't that far from transition, and that meant I was making progress! I felt encouraged and reenergized to get through the pain on my own. I think I went through transition shortly after that, although time has a different meaning when you are in active labor! I remember throwing up (for the second time) and shaking uncontrollably but honestly, even though the pain was worse I think it was easier for me to get through 7cm to 10cm than it was to get from 2cm to 7cm. I kept telling myself that it was almost over and I would be holding our little girl very soon. And that I could do it! I may hate it, but I could do this! Anthony and I really got into a rhythm around this time, which helped immensely. I remember asking my nurse early on in my labor "how do women sleep during labor? This is terrible"! But I realized that even if there are only 20 seconds in between contractions, you fall asleep because you're just so exhausted. I would rest on the edge of the bed in between contractions, and then as soon as I felt one coming on, Anthony and I would stand up and I would hang onto him as we swayed through the contractions. They called this "the labor dance" in our childbirth classes and of all the labor positions I tried it was my favorite. We were listening to music from one of my Spotify playlists the whole time (this song stood out in my mind), and really focusing on that and moving with the music helped take my mind off the pain. Anthony told me later he could tell the contractions were getting worse, but that I was really calm and "in the zone". I started feeling pretty intense pressure around 4am, and they checked me again and I was at 9cm. It took until 5:45am for me to get the whole way to 10 and then it was time to push! Honestly, pushing felt so much easier to me than getting through the contractions and dilation. Probably because I had a real job to do at that point, and was very motivated for labor to be over! I ended up pushing for an hour and a half total. Towards the end, I remember them saying several times her head was right there and just one more contraction and she would be here! But that happened over 3-4 contractions (so 9-12 pushes) where her head was almost out, but just not quite fitting. I was getting so exhausted I said something like "I don't think I can do this anymore" and I found out later in talking with the doctor that Sage was having heart rate decelerations, so they suggested using the vacuum extractor to help deliver her head. I remember looking up at Anthony and he said, "I think we should just get her out." I agreed and from there, it went super fast. Crowning was as intense as everyone says it will be, but it was over so quickly and then our baby girl was born! The third stage of childbirth, aka everything that happens immediately after the baby is born is a bit of a blur because I was so exhausted at that point. But unlike the rest of labor, I felt fully present in my body at the time and the hour after I delivered Sage felt like it took forever. Because they had to use the vacuum extractor to help Sage's head out, I had second degree tears in 3 places. But before they could set about the repair, they needed to deliver my placenta. I remember the doctor applying "controlled cord traction" and in the reflection of the ceiling light above me I saw the cord snap. The doctor then had to manually extract my placenta, which is exactly what it sounds like and not a pleasant experience by any means. I honestly can't remember the timeline of how this all happened, so it may have been exactly what was necessary. But for my next birth I may add to my birth plan that I want to try expectant/physiological management of the third stage which means leaving the placenta and cord alone and letting my body deliver it on it's own time (within reason). "Controlled cord traction" is considered active management, and is very common and usually very safe. For me, the cord snapping along with the tearing lead to more blood loss than is typical for childbirth and caused me to develop iron-deficiency anemia. The good news was, I was borderline so they gave me the choice of having a blood transfusion or taking iron supplements and we opted for the iron supplements. They wheeled us over to my recovery room around 8:30 or 9am. At this point, we had been awake for over 24 hours but I felt amazing. 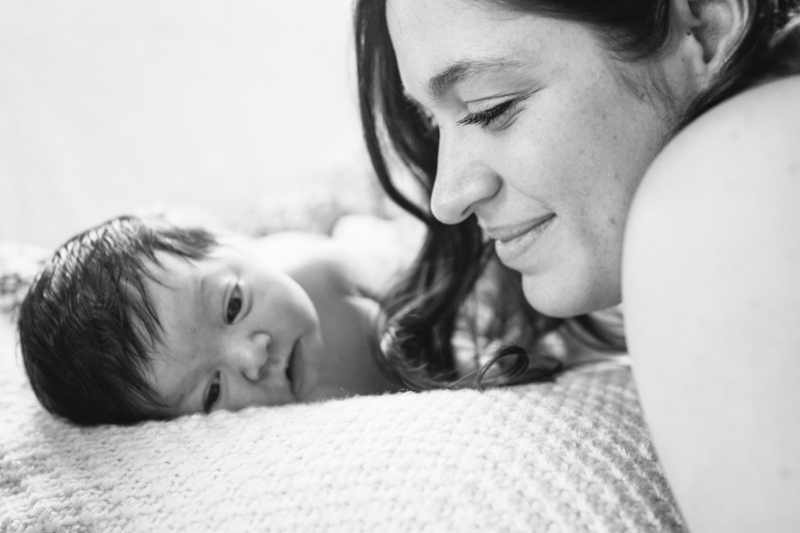 I had read about the oxytocin high that comes after natural childbirth and wanting to experience that was a big part of what drew me to choosing a drug-free birth. I was barely in any pain, and felt totally fine and ready to handle the day with just a 15 minute nap. I was so happy that Sage was here and I loved every minute of our first day together as a family of three. Of course, that didn't last forever and on Tuesday, I felt like I had been hit by a mac truck. By Wednesday my overall pain was decreasing but it was less of a general pain like it had been up to that point and I could begin to differentiate what hurt and when. Other than that, it's really hard for me to remember our time in the hospital (I'm glad I took pictures!) because I barely slept at all so it felt like one big blur! On Wednesday afternoon, after a weight check, an exam from the pediatric nurse practitioner and some more blood tests for me, both Sage and I were discharged and it was time to go home! It's really hard to put into words, but I feel that giving birth to Sage changed me on a fundamental level. As challenging as childbirth was, it was also incredibly empowering. Childbirth, and now breastfeeding has given me a different kind of confidence for what I'm capable of and gratitude for what my body can do. Sage's birth was such an intense physical, emotional and spiritual experience. I thought Anthony and I were as close as we could be, being friends for 15 years and together for almost 12, but Sage's birth has brought us even closer. Of course, caring for a newborn can be challenging but I've never felt such deep happiness in my life. I don't have any other words than just, I'm so grateful and so in love with our little family!